Do you still need affordable fares for your trips? Check this latest airline promo fares for September to December 2017! For as low as P1,499 travel from Manila to several places in Luzon and Visayas and P2,299 for trips to Mindanao. As for international promo, fly to foreign destinations for only P2,099 ALL IN fare. A Macau trip from Manila or travel to Hong Kong from Cebu or Iloilo cost P2,099. More sale tickets to foreign routes also available. Don’t miss getting cheap fares from this Cebu Pacific promo. Davao, Cebu, Boracay, Legazpi and other places are calling you to visit them. Cebu Pacific sale tickets are valid for one-way trip. Fares are ALL IN and includes the base fare, Web Admin Fee, taxes & fees and free 7 kilos hand carry baggage. Domestic terminal fees from Manila/Caticlan/Cebu stations are covered in the fare. 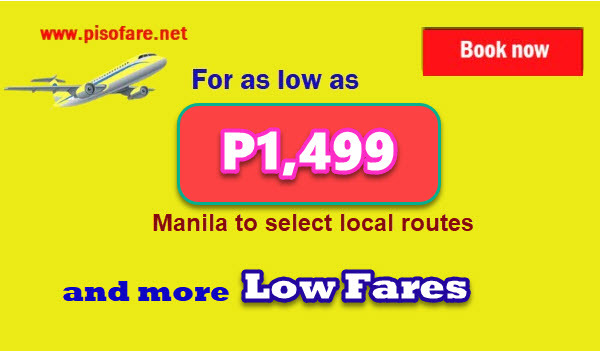 Avail the promo fares of Cebu Pacific by booking online at www.cebupacificair.com where you can book tickets without promo code. Book your tickets single way or round trip depending on availability of cheap tickets. Check this ONLINE BOOKING GUIDE on how to book Cebu Pacific promo tickets, if you need a reference. Other than the above, you may visit any Cebu Pacific sale or ticket offices, travel agencies or booking offices to buy the low fares. Reserving promo tickets may also be done by calling the hotline at these #: Manila- (02) 702 0888 or in Cebu- (032) 230 8888. Booking the Cebu Pacific affordable fares is until August 11, however, sale tickets are limited and may not be available on all flights. Book or buy promo fares while these are still available! Do you want to receive airline promo or travel updates? Like our Facebook: PISO FARE TICKET for more promo fare, PISO FARE of Cebu Pacific Air, Philippine Airlines, Air Asia, Skyjet and other airlines!